This is a website of the Yoshida lab (Functional Microbiology), Graduate School of Integrated Science and Technology, Applied Chemistry and Biological Engineering, Shizuoka University. The aim of our laboratory is to find unique cell functions in natural microorganisms and apply them to production of useful compounds to contribute new biotechnology. We usually use microorganisms isolated from various environments, which are suitable for practical use, and always make it important to analyze the microbial growth and find novel specific functions or microorganisms. 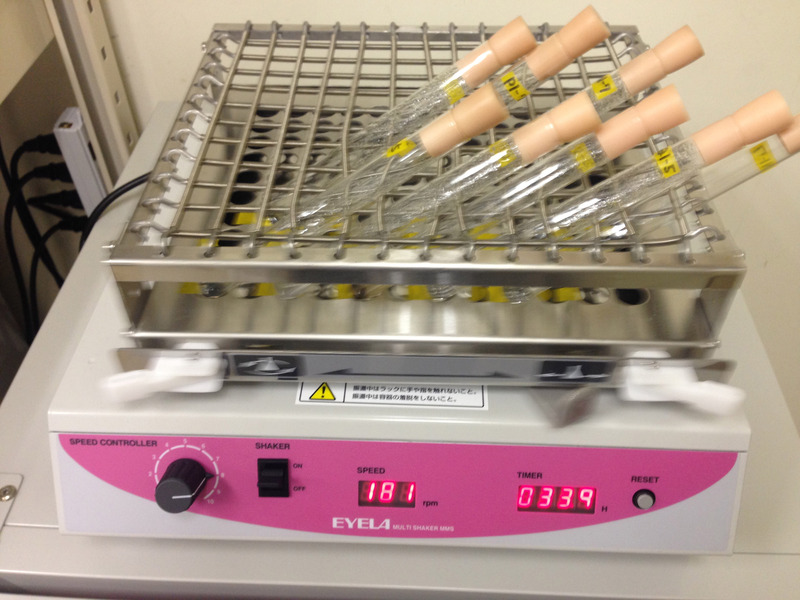 Recent interest of our laboratory focuses on oligotroph. An oligotroph is a microorganism that can grow at the very low concentration of carbon sources. Although there is no exact definition for oligotroph, in general, the concentration of the carbon sources is below 1-10 mg/L. We believe that oligotrophs are useful for bioremediation because such microorganisms can grow on the contaminant sites under the in-situ nutrient conditions without additional carbon sources. Oligotrophs are also thought to be useful for bioconversion because we can obtain the cells as the catalysts with low cost. So, we are interested in oligotrophs in terms of applied microbiology. Now, we are trying to isolate oligotrophs from various environments. Among them, we found an extremely oligotrophic bacterium, Rhodococcus erythropolis N9T-4 from a crude oil sample. This bacterium can grow on a minimal salt medium without any additional carbon sources. R. erythropolis N9T-4 did not grow on a minimal medium under CO2-limiting conditions, but grew on a minimal medium containing NaHCO3, or when CO2 gas was supplied under the same conditions; this indicated that the oligotrophic growth of N9T-4 depends on CO2. However, the N9T-4 genome has no genes encoding key enzymes involved in CO2 fixation in known autotrophs, and the most noteworthy feature is that N9T-4 does not require any additional energy sources for the oligotrophic growth, which are required for known autotrophs. So, we suggest that this bacterium has a novel low-energy type CO2-fixation system or specific metabolism of carbon dioxide. Surprisingly, we recently found that this bacterium can grow not only without carbon source but without also nitrogen and sulfur sources. Thus, N9T-4 can utilize the principal three elements for organisms, carbon, nitrogen, and sulfur, from the atmosphere. We propose a new bacterial category “aerotroph” which can utilize “air”. We are now investigating about the mechanism of the unique oligotrophic growth of N9T-4 and its application for the production of useful compounds such as biofuels. Transmission electron microscopic observation showed that a relatively large and spherical compartment was observed in a N9T-4 cell grown under oligotrophic conditions. In most cases, only one compartment was observed per cell, but in some cases, it was localized at each pole of the cell, suggesting that it divides at cell division. We termed this unique bacterial compartment an oligobody. The oligobody was not observed or very rarely observed in small sizes under nutrient rich conditions, whereas additional carbon sources did not affect oligobody formation. 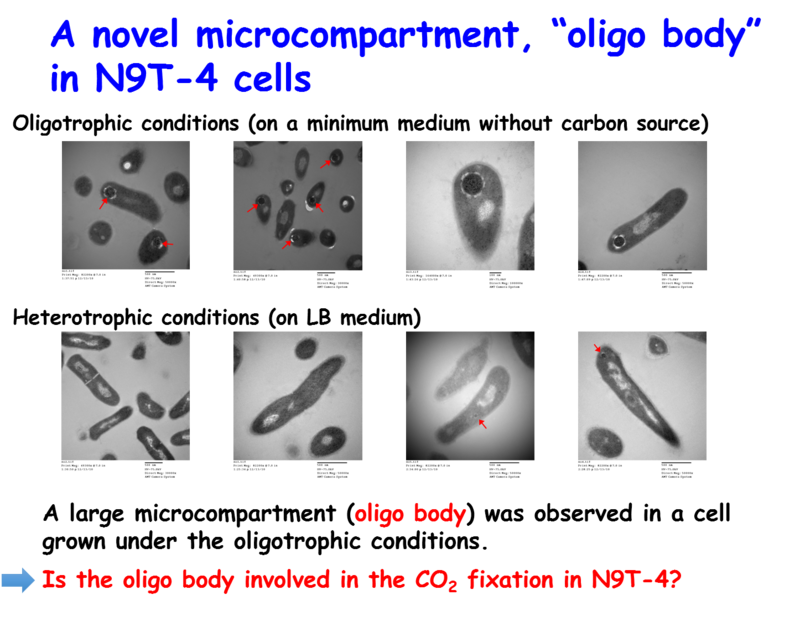 Thus, it is expected that the oligobody is a novel bacterial organelle involved in the growth of extreme oligotrophs such as N9T-4 and we are now examining the physiological role of the oligobody. One of the characteristics of our lab is most of our research are collaborated with Japanese companies for their future industrial application. Some projects are going on to find new microbial functions and enzymes, although we cannot explain here due to confidentiality. Let’s find new microbes and microbial functions with us!!! Copyright © 2019 静岡大学 微生物細胞機能学研究室（吉田研） All Rights Reserved.